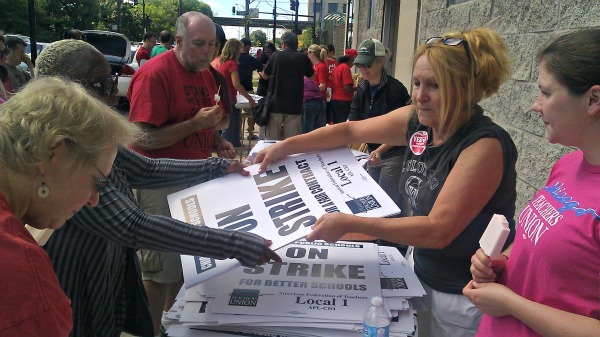 Teachers pick up 'on strike' signs Saturday at a 'strike headquarters' the Chicago Teachers Union has set up. Lead Story: It was a weekend full of long, heated negotiations late into the night. Then, CTU president Karen Lewis announced at a 10 p.m. press conference Sunday that the strike was on, the first teachers strike in the city in 25 years. The issues between the two sides are legion: a school-year calendar, longer school days, class size, etc. Yet during Lewis&apos; conference last night, many reporters kept pushing the question about pay and compensation, something Lewis even chastized reporters for. Rest assured, over the coming hours and days, we&apos;ll hear much, much more about the smaller nuances of the disputed talks as well as the bigger picture issues. While the sides are close to a deal in some regards, the general feeling is that this could be a while. Also: The NFL is back in full swing! The Colts’ Andrew Luck had a tough slog as the Bears overcame some early gaffes en route to a 41-21 clubbing of Indy at Soldier Field on Sunday. The Colts struck first on an early Jay Cutler interception deep in Bears territory, the Bears rattled off 17 straight points to take a lead they wouldn’t relent, driven by Cutler’s 333 passing yards which included two touchdowns. New receiver Brandon Marshall was Cutler’s favorite target, hauling in nine receptions for 119 yards and a touchdown. It was a solid game after a disastrous start, but things don’t get easier: Next up is a trip to Lambeau Field Thursday night to take on the rival Packers on short rest. And then: After a summer of mystery, Illinois U.S. Rep. Jesse Jackson, Jr. left the Mayo Clinic, where he received treatment for bipolar depression, and returned to his Washington, D.C. home with his family. Chief-of-staff Rick Bryant said he’s “hopeful” Jackson will be back in Congress when it opens its fall session today, but there&apos;s no official word and his official return date is unknown. Among those encouraging Jackson to take a slow path back to work is his father, Rev. Jesse Jackson, who denied the report about him being back Monday. Still, the question remains: What of Jackson, Jr.’s future? RIP: Francisco Fernandez, the oldest man in Europe at the time of his death at the age of 111. Fernandez was born July 24, 1901 and is survived by three children, seven grandchildren, 14 great-grandchildren and one great-great-grandchild. With less than two months to go until the election, it’s time to start focusing on the factors that will determine the next president. The awful story behind a deadly marching band hazing incident at Florida A&M. Only 17 years after the fact, former prosecutor Christopher Darden decided it would be a good time to allege that Johnnie Cochran (now deceased) tampered with the infamous bloody glove that O.J. Simpson just couldn’t fit into during his 1994 double murder trial. Who says NFL players aren’t invested in the world around them? Late last week, Minnesota Vikings punter Chris Kluwe wrote a wonderful [albeit very profane] defense of fellow NFL’er, the Baltimore Ravens’ Brendon Ayanbadejo, who faced criticism from a Maryland state delegate for voicing support for the state’s proposed initiative legalizing gay marriage. The mysterious hum of Seattle? It’s caused by fish, apparently. It looks like Saturday Night Live is once again dipping in to the Chicago talent pool to fill some vacancies. According to reports, Aidy Bryant and Tim Robinson, both of Second City and a slew of other fantastic comedy groups, have been tapped to join the cast this fall. Another sign of the dry, hot summer’s impact: Lake Michigan is down almost a foot from its normal depth. BP is shelling out a lot of money – and more to come – as a result of their tainted gas escapades. Now that Drew Peterson has been found guilty of murdering ex-wife Kathleen Savio, don’t expect a charge any time soon in the death of missing ex-wife Stacy Peterson. Also not happening any time soon: Lance Armstrong running the Chicago Marathon. The Simeon High vs. Morgan Park High football game on Friday night was canceled when a large fight broke out amongst fans; one person was stabbed in the melee. Cook County is gearing up to battle a judge’s ruling that the Bears don’t owe the county millions of dollars in amusement tax collections. The White Sox lost in extra innings to the Royals yesterday but with the Tigers on a three-game skid, the Pale Hose are still two games up on Detroit heading into this week’s huge four-game series at the Cell. Darwin Barney’s errorless game streak reached 125 games yesterday and he passed Ryne Sandberg’s NL record of 123 earlier in the weekend. Next up: the major league record of 141 games. It was a good weekend for Northwestern, NIU, and Notre Dame but a really bad weekend for Illinois. In honor of yesterday’s start to the NFL season (with two more games to go Monday night! ), here’s every NFL fan in 90 seconds.